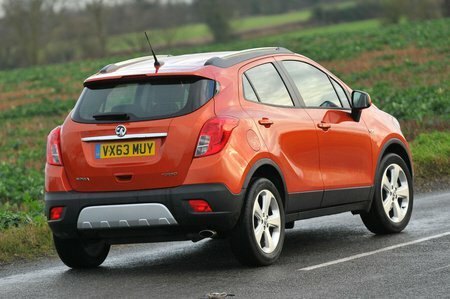 Used Vauxhall Mokka Review - 2012-2016 | What Car? What's the used Vauxhall Mokka hatchback like? When the Vauxhall Mokka launched in 2013, it was intended to inject new life into the brand. To an extent, it did just that and has been an impressive sales success ever since. So much so that it was only slightly altered when the facelifted Mokka X arrived in 2016. It helped that the Mokka’s roll-out was timed perfectly to capitalise on the sudden growth in the market for compact SUVs. In addition, the Mokka was good value to buy new, scored top marks in Euro NCAP’s crash tests and the chunky styling still looks great several years on. Unlike the Renault Captur, you don’t get sliding rear seats in a Mokka, but leg room and head room are still adequate for all but the tallest adults. The Mokka can, though, feel a little narrow, making it difficult to fit three across the back seat and increasing the chances of bashed elbows in the front. At least that might distract you from looking at the mess of buttons that form the heater and audio controls or noticing the rather meagre in-car storage. The boot is smaller than you’ll find in a Peugeot 2008 or Suzuki Vitara, but still large enough to take a couple of cases or a folded buggy, and it also benefits from an almost flat loading lip. However, while the rear seats do drop down, you first need to flip the bases out of the way, which feels old-fashioned in this age of one-touch seat folding. Ride comfort is also somewhat lacking, with the Mokka picking up on all sorts of bumps and dips in the road. The car is not helped by seats that lack support and a body that leans over as soon as you turn into a corner. There’s a fair bit of road and wind noise to endure, too. As for engines, the highlights are Vauxhall’s 1.4-litre turbocharged petrol and its smooth and punchy 1.6-litre diesel. It’s a shame you have to put up with a notchy gearchange and lifeless steering, though. Unlike many of its rivals, you can also have Vauxhall’s compact SUV with four-wheel drive, which might appeal to those living in rural areas worried about getting stranded in the winter months. So, the Mokka effectively straddled two classes, being somewhat larger than a Juke but smaller than a Qashqai, and it did so with some sales success. It now stands as an interesting used buy. It wasn't outstanding to drive, but it was a well-rounded and neatly styled package that delivered plenty of kit and a decent level of practicality. The Mokka became the Mokka X in 2016, with changes to the front and rear styling and a redesigned dashboard being enough to warrant the addition of the 'X' moniker, although the car retained the stature of the original and a lot of its underpinnings.